Healthcare Exchange California, How Much Will it Cost? 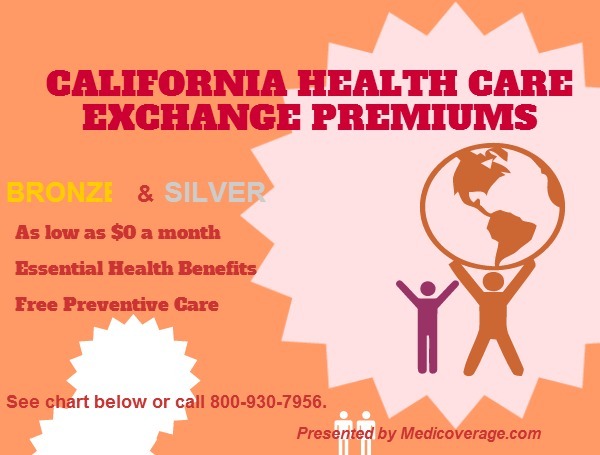 Bronze and Silver plans offer the most affordable monthly premiums of the new Healthcare exchange metal plans. These plans offer the same essential benefits required of all metal plans. Click here to compare Bronze, Silver, Gold, Platinum side-by-side. The chart below demonstrates the average monthly premium in California. CA plans are based on plan, region, and provider, to learn your specific monthly premium for your area or for Gold or Platinum premiums, call 800-930-7956. The information below is what you will pay after Federal Premium Subsidies kick in. *The figures are above are for individuals. Remember these numbers are averages and not your specific premium, click here to get your specific Exchange Premium. Although the monthly premium might be somewhat higher than Bronze, remember with Silver you pay 30% of your medical costs, Bronze 40%. As well as if you fall below 250% of the Federal Poverty Line (FPL) -under $28,725, and have a Silver plan, you may qualify for Federal Cost-Sharing Subsidies. Weigh both before you decide on your plan. For specific premium information for your CA region or state please contact Medicoverage.